My last Anthro sale purchase, the Furoshiki Packaged Chemise by Anne Pinkerton came last week. I have been gravitating toward over-sized bows (which is funny because I used to hate bows because they made me feel like I was a package waiting to be unwrapped), but the Eva Franco Learning Curves Dress didn't work out for me, and I completely missed out on Anthro's Precious Metals Cardi - I tried one on during a sale and sadly talked myself out of it. O well. So when this chemise went on sale, I snatched it up. I had previously reviewed the Furoshiki Packaged Chemise here. I had an XS shipped to me (my store had it shipped free since they didn't have this size), and it arrived this past week. So I thought I'd give a more detailed run down of it now that I've worn it out and about. As the name suggests, Anthropologie intended this piece as loungewear/sleepwear. Of course, I bought it to wear out and about. Because it's made for loungewear, it's super comfortable. The top portion of the dress is mostly rayon with a smidge of spandex. The bottom portion is 100% cotton. Of course, the fact that it was made for loungewear has some drawbacks. The skirt is actually lined but even so it is pretty transparent. I definitely wouldn't wear this out of the house without a slip. But adding a layer makes me pretty happy, especially in the colder months, and especially if that layer has gorgeous lace hemlines that can peek out from under the skirt (such as with Anthro's Navy Garland Slip). It's definitely a cute dress. The large ribbon on the bodice is a great detail that doesn't overwhelm because it lays flat and is in the same fabric as the rest of the bodice. But the bow still captures the eye because its rimmed in dark grosgrain ribbon. The skirt is gathered quite a bit where it meets the top, creating quite a voluminous bottom. And, the hem of the skirt is rimmed in grosgrain ribbon for a nice finishing touch. I thought this dress looked great belted. It gave a more defined waist and made the dress feel a little more outdoor appropriate. I think its colors are perfect to bring into Fall. I layered the chemise with a long sleeve top, comfy oversized cardigan, tights, and boots for the cool Fall weather, and it was PERFECT! See wrinkly mess! Oh well, I still like it and plan to wear it out. No, the skirt didn't get shorter. My bestie Clara decided to pull my slip down further for this pic because she wanted to see more lace, lol. Oh yah!!! And look, one of the best things about this baby... IT'S GOT POCKETS!!! WOOHOOO! Also, today's photos were taken by Evan (except I believe the last pic was taken by Clara)! These are the first pics I've done away from my house. 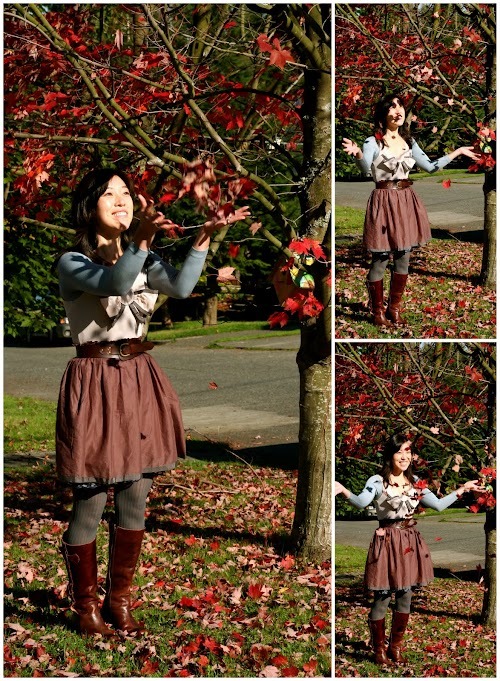 I've been excited to take a picture with some of the Fall leaves, and I was so happy to get the chance! And I also had to get a picture in the middle of an empty street, lol. After all, now that I know the top five places to find a fashion blogger, I think I need to work on hitting each locale. Clara really wants me and Evan to go take pics in Gas Works Park sometime, so I can also knock out the 'urban decay' location shoot at some point :). Apparently, she also has some cool stairs in mind. Who knew she would be my photography scout, hehe. I was nervous today though. I'm not quite comfortable having someone photograph me all serious style, and I felt funny in the middle of the street where people can see me randomly get photographed. Hence the running shots. Those weren't planned. I just got really really shy and said, 'ok we're done,' and I ran away. And Evan kept taking pics. Smart I guess, because they look kinda cool. Your pictures are so cute! Love the leaves! Oh Lori, this looks like such a fun photoshoot. I love the pics of you playing with the leaves, and the ones of you running down the street! I get quite shy getting my husband to take photos of me too. of course, I'm too conscious of people looking in! I really love what you did with the chemise. Sleepwear as outerwear, that's very clever! the way you styled it looks like it was made for day wear rather than sleepwear. great review!! I envy your ability to wear night clothing by day. And I love my Precious Materials Cardi. But I had to gt it on eBay. Kudos for Evan to keep snapping while you jammed across the road. those are great photos. But the ones where you are throwing flowers are by far the best photos. The sun is shining on your face just perfectly. He captured you in your moment. These are great pictures and I love your outfit! I absolutely love this look. You are so cute! That skirt and blouse are fabulous. Great post! I just bought this also and was thinking of ways to wear it out. I think you put it together very well. Could your outfit get any cuter? I think not. You look beyond gorgeous! You look ADORABLE!!! Love the dress on you and it looks like you had a fun time while taking these pics! these photos are so cute! love it. I know how you feel about being broad shouldered!! people usually say to me "wow... i didnt know you were so..big (shouldered)". -_-. haha. You totally transformed one of the difficult piece into something totally workable wearable and you did great! I really envy your creativity and you look great! pictures are awesome! I love that you're wearing a chemise as a dress -- I wore one on Sunday, and I think it worked well. Many times, you can't tell the difference -- and chemises are usually cheaper, too! And the navy slip looks perfect under this chemise/dress. If I hadn't read your outfit details, I wouldn't have imagined they were separate! I love how you wore this! Fantastic outfit. Can't believe they would sell this as sleepwear, because it looks perfect for daytime! @Matt thanks. To be fair, these pics were only a couple houses up from mine, so I only just barely took pics away from the house. haha! @Peggy @theanthropologieconnoisseur Thanks so much! @Vintageglammz really? You look totally relaxed and radiant in all your outfit photos out and about! @Laura Congrats on getting the Precious Materials Cardi on ebay! It's so gorgeous on people across the blogosphere. And the bow's whimsy just makes me so happy! @LilMissSeamstress & @Kelly thanks! I'm really glad my vision of nightwear as daywear translated ok! @LC ooh! I'm looking forward to seeing how you style it too! @Christy Thanks! I agree you can't keep these beauties at home. This is the first chemise I've used as outerwear, but I'm definitely going to keep my eyes open for other neat options!